This order was sufficiently complicated that it's taken a couple weeks to fully come together. The client wanted to work Hindu elements (particularly emblems for Kali, Ganesh, and AMMA) into a Sheridan design. That on its own took some time but we upped the complexity a bit by narrowing the strap to 2" instead of the normal 2.5". That half an inch can make a big difference sometimes. Going with the theme I replaced the typical flowers used in Sheridan with lotus blossoms and heavily employed tinting to give the entire design some contrasts. 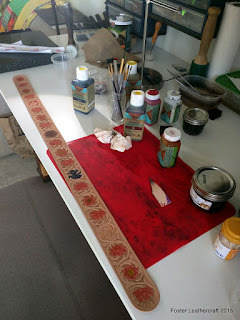 In addition there were two modifications to how the guitar strap connects to the guitar. 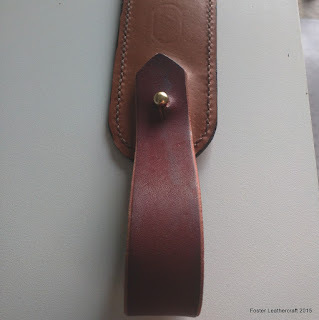 Instead of having a hole at one end of the guitar strap we fixed a loop of latigo that closes with a stud button. That will wrap around the neck of the guitar and should work pretty well. On the other end I'd changed the cut of the little strip that connects to the bottom of the guitar. Formerly it was cut with a 2" square at one end for the strap to feed through itself. Material-wise this has been a cumbersome part of the pattern and in this case I was worried about the strip being as wide as the strap. So I replaced the square with a Dee and that seems to work reasonably well. The strip can be fed through the Dee in the same manner as before, or, since the Dee is too large to feed back through the strap, it can hold the strip in place on its own allowing for more options in how the strip and strap connect. All in all this has been a pretty heavy project but I'm pretty content with how it's all come out. I'll probably start working some of these elements into the "default" design for the Bard guitar straps. The client has exquisite taste, both in art and artisan.